A night of the very best ROCK and BLUES with top UK band "Hundred Seventy Split" featuring Leo Lyons and Joe Gooch (formerly with Ten Years After). HSS play "High-energy Blues/Rock" and include some "Ten Years After" songs in their set list. 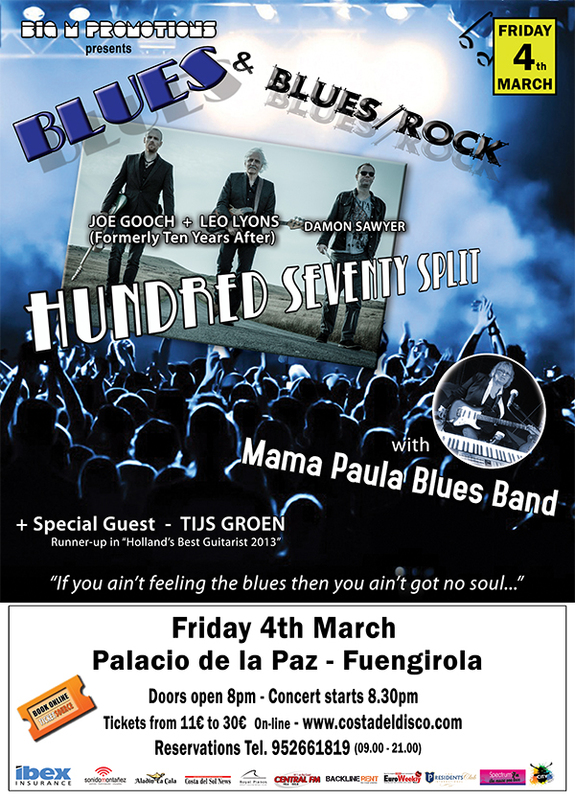 The "Mama Paula Blues Band" are highly respected on the Costa del Sol and beyond. Mama Paula and Marcelo Saenz together create a unique sound faithfull to the blues. Opening the concert is Tijs Groen, a young Dutch guitar/vocalist who was runner-up in the "Holland's Best Guitarist" competition in 2013. Doors open at 8pm and the concert will start at 8.30pm. There is seating for approx. 250 in the main hall and 6 balcony boxes that seats between 20 - 27 each. The remaining tickets are standing only. Groups of 12 or more should contact the promoter for special group rates. PLEASE NOTE: For online ticket purchases, entry to the event is by e-ticket so please print it and bring the e-ticket (with the qr code) with you when you come along to the venue. It is your responsibility to keep the e-ticket in a safe place as you would money or regular tickets. Entry is NOT possible without the e-ticket. If the e-ticket is copied, it will be invalidated by the venue's security system preventing entry to the event. #Tickets purchased online must be registered on the Box Office scanner by 21.30h or they may be resold. A full refund of the ticket price (less admin fee), or alternative seating will be given to the original purchaser on presentation of proof of purchase if the tickets are resold. NO DRINKS OR FOOD CAN BE BROUGHT INTO THE VENUE. Groups having one E-Ticket must enter together. This concert is not recommended for children under the age of 8, and children under 16 years old must be accompanied by an adult at all times. Una noche llena del mejor Blues y Rock interpretado por: desde UK "Hundred Seventy Split" (Leo Lyons y Joe Gooch ex "Ten Years After") con su "Alta energia Blues/Rock". HSS tambien tocar varios canciones mas conocidos de "Ten Years After". El popular Mama Paula Blues Band con Mama Paula y Marcelo Saenz con el mejor de los Blues. El primer artista sera Tijs Groen, un joven holandés que llego en segundo lugar en el concurso "Mejor Guitarrista de Holanda" en 2013. Hay asientos para unas 250 personas en la sala, con 6 palcos con 20 a 27 asientos, lo demas son entradas a pie. Este concierto no está recomendado para niños menores de 8 años. Niños menos de 16 años tiene que ser acompañado por una persona mayor. IMPORTANTE: Las entradas que se compran en el sitio web. La entrada al evento es por e-ticket, así que por favor, imprimir y llevar el e-ticket cuando venga a el auditorio. Es su responsabilidad guardar el e-ticket en un lugar seguro. El acceso al concierto no es posible sin el e-ticket. Si se copia el e-ticket, queda invalidado por el sistema de seguridad digital de taquilla, y evitará la entrada al evento. #Entradas Comprados por vía de la pagina web deberán ser recojido antes de las 21.30h o puede serán revendidos en la taquilla. Un reembolso completo del precio de entrada (menos gastos de gestión), o asientos alternativo, se le dará al comprador original en la presentación del comprobante de compra. Disclaimer.The promoter reserves the right to change the line up of any concert should an artist(s) be unable to perform for any reason.